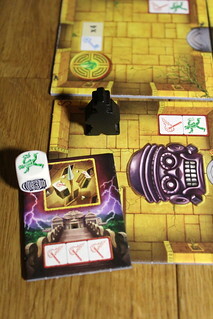 Your situation in Escape: The Curse of the Temple is grim indeed: escape the temple in ten minutes or be trapped forever. Escape is one of the not-so-numerous entries in the category “real-time cooperative games” that was founded, popularized and, until Escape, solely occupied by Space Alert. Almost everyone around here loved that game, so backing the Escape Kickstarter project when it launched wasn’t a tough decision, another real-time coop, woohoo! I don’t really want to get into the internet drama about the Kickstarter campaign much: some things took a bit longer than people wanted them to, the flow of information from Queen Games to the backers wasn’t as good as it could be and not everything was delivered as advertised (signed and numbered boxes vs. signed and numbered sticker to put on the box, for one thing). To be utterly honest, I only learned that there was any sort of drama after I had the game in my hands, and for me it was what I wanted, in Queen Games’ usual high quality. I understand the complaints and I hope Queen Games – and other publishers – learned from what went wrong, it’s just that none of the problems upset me on a personal basis. Back to the game itself, though. You find yourselves in the Temple’s basement, with only 10 minutes to escape before the temple will collapse on top of you. And the tools at you disposal are more random than you want in a life-and-death situation: dice. Lots of them. Five per player. And forget about taking turns with the rolling, this is real-time, remember? You roll as fast as you can, as much as you, all at the same time. You can put dice aside and reroll them any way you want, the only restriction is that you have to reroll dice that you use for an action. As an action, you may move your Meepiana Jones – sounds way nicer than adventurer meeple, doesn’t it? – to an adjacent room rolling one adventurer and one key, torch or additional adventurer, depending on the room. What you need is shown in bright, big symbols on the room tile you want to enter, since time is of the essence you don’t want to waste it thinking what you need. If the room you’re in has an unused doorway, you can spend two rolled adventurers to draw the next room tile and connect it to the that doorway, discovering the temple at a brisk running pace. Not much cooperation so far, everyone is running around like headless chickens with their own dice. Cooperation becomes an issue when you’re trying to activate magic gems which are absolutely essential for you to escape. 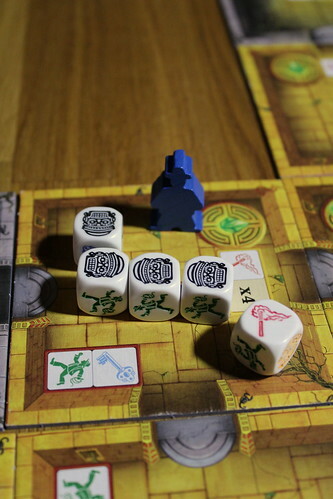 The simple type you can activate alone by rolling either four keys or four torches – again marked on the tile and very hard to miss. But doing this in a team is much quicker already, all players in the room can put their dice to gether to activate a gem. With the bigger gem chambers, cooperation is essential. In these you have a choice: activate one gem for four dice with the right symbol, two gems for seven or three gems for ten. Once you activated gems, there is no way to go back and activate more – take too few gems, and you might not be able to escape the temple at all. Another important spot of cooperation is dealing with curses: roll a black mask and that die becomes cursed, you can not reroll it any more and it’s completely useless. To release such a die again, you have to roll a golden mask – or another player in the same room has to. For both reasons, it’s usually the best idea to walk around in teams, you activate more magic gems more easily and you’re less likely to become stuck with five black dice with an adventuring mate to help you out. The rumbling suddenly grew louder, almost knocking me off my feet. A yell echoed through the ancient chambers. “Guys! You might want to get your asses back to the first chamber, something weird is going on. Move! Move!” I had learned long ago not to ask questions when someone told me to run. It had cost me my left eye, but fortunately the eye patch made me look good in a piratey way. Two eye patches? Probably not. So I ran. A ten minute time limit is technically enough to call Escape a real-time game, but not very exciting. To spice things up, the audio CD you play in the background will present you with an ominous gong twice in that period. Your signal to start running even faster than before and back to the entrance chamber: when you hear a door slamming shut a very short time after the gong rings, every player not back at the start loses one die until the end of the game. Oops. The third time the gong rings starts the countdown before the temple collapses. By now you should have discovered the exit chamber somewhere near the bottom of the stack. If not it’s probably best to give up right now. But if you did find the exit, you have to be there and roll keys – the less gems you activated, the more keys you need. If you didn’t activate enough gems you’ll need more than five keys. And it’s every player for himself here, no one can help you. Do you see how that might become a problem? But Escape is not a hard game, you will usually make it out alive, although not with much time left. Besides the real-time aspect, Escape doesn’t have all that much in common with Space Alert. Of course you still need to cooperate to escape, but you don’t need to coordinate beyond “we go this way, you go that way”. Or maybe you move all together, because the one thing everyone learned from watching Scooby Doo is that splitting up only leads to trouble. Either way, there’s none of the frantic planning and discussion of Space Alert, instead you get frantic dice rolling with the occasional cry of “Someone throw me a mask, quick!” It’s still frantic, it’s still fun, but don’t assume just because you love one game you will be happy with the other. 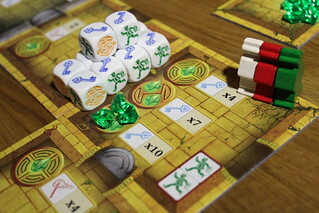 Already included with Escape are two expansion modules, Curses and Treasures. You may be surprised to hear that Curses are bad for you and Treasures are good. When you discover a room with a curse or treasure symbol, you draw a tile from the respective pile and keep it. Curses stay with you until you, and you alone, roll the three symbols on the tile needed to discard them. They range from seriously dangerous – being stuck in the current room until you discard the curse – to the slightly annoying – all dice falling from the table are permanently lost – to the downright silly – having one hand stuck to your forehead. Treasures, on the other hand, help you once, then you discard them. They might have two bonus torches or key to use, unlock all currently cursed dice or, especially useful, add a secret passage between two rooms that didn’t share a door before. Adding both expansions to the game seems to make Escape slightly easier, not harder, and adds a small layer of complexity. What it doesn’t add that I was desperately hoping for is more player interaction. The main reason I enjoy cooperative games in general and Space Alert in particular is the high level of interaction to come up with a solution, and Escape just doesn’t have it. You’re mostly rolling dice for yourself, only occasionally activating gems together and uncursing dice for other players. Lack of interaction in a cooperative game makes me a very sad panda meeple. Despite that, Escape is fun to play. It’s frantic, it wakes you up when played first thing after breakfast, and unlike most other coops it should be a ton of fun for kids, too. But the lack of interaction and the lowish level of difficulty makes it a merely nice game for me and keeps it from being a great game. With a last, loud noise the temple collapsed behind us. I swear, that falling rock ripped the sole of one of my favourite archaeology boots, that’s how narrow that escape was. One day I’ll find out how and why every single, bloody, ancient culture on this planet build their temples and palaces to be death traps. Didn’t they have people pressing buttons just out of curiosity? Or did they have them, and that’s why we don’t find many more sites to exploit… um… plore. Explore. We’ll have a lot of time to discuss that on the march back through the jungle, as it turns out we were parked on top of a part of the lower floor that collapsed. That car rental guy is not going to be happy.